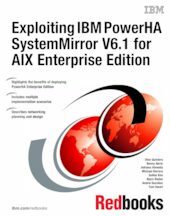 This IBM® Redbooks® publication positions the IBM PowerHA® SystemMirror® V6.1 for AIX® Enterprise Edition as the cluster management solution for high availability. This solution enables near-continuous application service and minimizes the impact of planned and unplanned outages. The primary goal of this high-availability solution is to recover operations at a remote location after a system or data center failure, establish or strengthen a business recovery plan, and provide separate recovery location. The IBM PowerHA SystemMirror Enterprise Edition is targeted at multisite high-availability disaster recovery. The objective of this book is to help new and existing PowerHA customers to understand how to plan to accomplish a successful installation and configuration of the PowerHA SystemMirror for AIX Enterprise Edition. This book emphasizes the IBM Power Systems™ strategy to deliver more advanced functional capabilities for business resiliency and to enhance product usability and robustness through deep integration with AIX, affiliated software stack, and storage technologies. PowerHA SystemMirror is designed, developed, integrated, tested, and supported by IBM from top to bottom.